Why Do Bumblebees Dig In The Ground? Do Bumble Bees Dig In The Ground? The lady was quite sure it was a bumblebee she had observed, rather than a mining bee, which may be seen burrowing into soft soil to create a nest. In asking the question, she wanted to know why the bumble bee was digging – whether it was to create a new nest, or whether the bumble bee was digging a hole for the purpose of hibernating. In studying bumble bees, scientists have uncovered several reasons why bumble bees may dig in the ground. the bumble bee is creating a small area in which to hibernate. But how do we know which? Some species of conopid flies affect the behaviour of some species of bumble bee, and generally workers rather than queen bumble bees. Female conopid flies rest on flowers and attack bumble bees in the air, or foraging on flowers. Eggs are deposited into the body of the bee where they grow and develop. Before dying, the host bumble bee may dig into the soil about 5-10 cms, where the conopid flies are now able to hibernate to remerge the following year. These parasites live and mate in the soil, and it is the females which attack queen bumble bees, usually during their winter hibernation, but more rarely they are also believed to attack early emerging queens. The female nematode is fertilized, and releases its eggs into the body of the bumble bee queen. 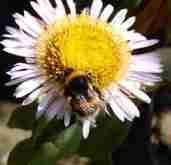 The bumble bee is sterilised as a result of the infestation, and her behaviour alters. It is suggested by some that instead of searching for nest sites, the queen searches for hibernation sites, although scientists do not necessarily agree on this point. Some suggest the queens search for both hibernation and nest sites, yet dig shallow holes in situations unsuitable for either. However, the juvenile nematodes are released into the soil via the bumble bee queen’s faeces (poop). It is suggested that in some cases, infestation may spread from one queen to another, when an uninfected queen inspects a hole dug by an infected one, whilst searching for a nest site. Toward the end of the life of a bumble bee colony, new queens will emerge. They will mate and feed to prepare themselves for winter hibernation. In the scenario described by the lady, I suspected the bumblebee was actually parasitized, for the simple reason that I believed it was far too early in the season for hibernation to be occurring. 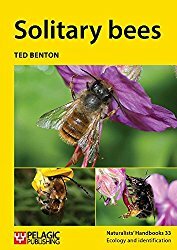 Take a look at my page Which bees dig in the ground?